Another was a replica of the preamble to the Constitution, blown up to stretch 250 feet. The symbol has great resonance politically, but is the Constitution really an aid to the Occupiers? It’s pretty clear that the Founders wrote the Constitution to limit and channel the influence of “the people,” and to protect the interests of better educated–and wealthier–minorities–like the Founders themselves. And it certainly works, as they intended, to slow the pace of policy reform or political change. Recall that the Civil War preceded Constitutional reform on slavery. But Occupy is hardly unique in tacking its claims to an elusive or resistant document. The Constitution is a popular prop for social movements in the United States. 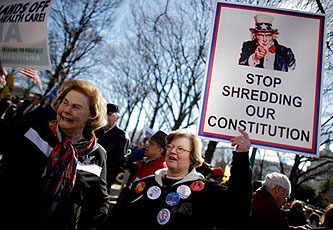 Tea Party groups are also quick to roll it out and chastise their political enemies for disrespecting it. Even so, Tea Partiers have called for repealing or radically altering the 14th (birthright citizenship), 16th (direct election of US senators), and 17th (allows federal income tax) amendments. They’ve also been eager to undo Supreme Court decisions they think have misinterpreted the Constitution, going back, at least, to Marbury v. Madison (1803). Former Speaker of the House Newt Gingrich, seeking Tea Party support, has announced his intent to have judges called before Congress to explain themselves. Be assured that activists with limited Constitutional studies in their backgrounds will be quick to question a Supreme Court that allows a national mandate for individuals to buy health insurance. So activists view the Constitution as an obstacle to change, but only to those changes that their political opponents promote. At the same time, both the Occupiers and the Tea Partiers are smart to refuse their opponents exclusive authority to claim–and define–the document. This entry was posted in Uncategorized and tagged amendments, Constitution, Newt Gingrich, Occupy, Rose Parade, tea party. Bookmark the permalink. “Occupy” is a symptom of unhappiness. I don’t see any “Occupy Pyongyang” movement in North Korea. No hippies there!